Looking to get a reasonably priced flashlight for looking under ledges and coral heads in the keys. as I've been known to lose flashlights while diving. I see there is a pretty big difference in price between your 890 lumen light vs your 630 lumen light. Is that price difference entirely due to brightness or is there some other factor? Thanks so much for the order. My advice is to progress slowly and try to find a local club or mentor to show you the ropes. If you have any questions, please let me know..
Dano...just put in a nice sized order in for you. Your prices and reviews from other spearos led me to buy everything I needed from your site. If you have any advice for a newb who just fully outfitted himself (including anything I may have forgotten or may need) PM me. Looking forward to have some high quality stuff to get me into the sport!!! Thanks a lot Dano, the suit works great. Mako really does have top shelf customer service and I will definitely be calling soon for a new gun. 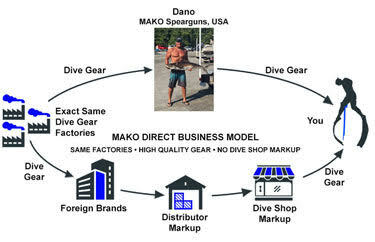 Hello Dano, have you got your womens wetsuits in yet? Brian: I think Tinman answered that for you in the thread. Thanks!